Last Thursday, the Sound Transit Board was briefed about progress on East Link and the related Downtown Redmond Link Extension. East Link construction has been well underway for a few months, with visible progress from Mercer Island to Overlake, while the Downtown Redmond extension is still in early design and is awaiting the publication of supplemental environmental documents. For the Downtown Redmond extension, Sound Transit plans to release a request for proposals (RFP) in October that will kickstart the selection process for the project’s design-build contract. Similar to the contract used to build South 200th/Angle Lake, the design of the stations and construction of the entire project will be left to a single contractor and would compress part of the planning timeline. Sound Transit expects to have development agreements with the City of Redmond, King County, and WSDOT in place by early next year. The 3.4-mile Downtown Redmond extension is expected to begin construction sometime next year and open in 2024, with two stations and 1,400 total parking spaces. Meanwhile on the other sections of East Link, Sound Transit has over 1,000 tradespeople and workers who are actively involved in construction and is still trending on schedule for a mid-2023 opening. 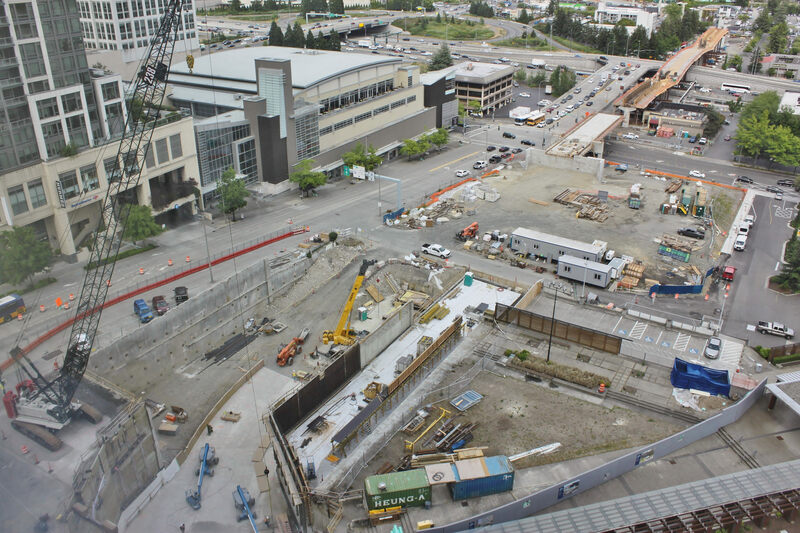 Excavation of the 2,000-foot tunnel under Downtown Bellevue is about 90 percent complete and is expected to break-through at the north end later this month. The tunnel, unlike University and Northgate Link, is being dug using conventional excavators and cutters instead of a tunnel-boring machine due to its short length and to prevent potential disruptions. All of the elevated guideway piers between 120th and 130th streets in Bel-Red have been finished, while work is still underway in southern Bellevue and at the crossing of I-405 in downtown. Overlake Village Station’s retention vault has been completed with assistance from the City of Redmond, and excavation at Redmond Technology Center Station is still in progress. On Mercer Island, the first sections of track for East Link are being welded together into 560- and 800-foot-long “strings” on Interstate 90. The tracks will be stored in the former I-90 express lanes while awaiting future installation, which is still a few years away. The ST3 specifics have a line item for all East side Link projects, of which this is one. Is there any idea of this current project cost? Redmond Extension has not yet been baselined. Thanks guy! I’m particularly curious about the Downtown Redmond Extension. If Lynnwood Extension is suddenly more expensive, will this be too? That depends on the construction market’s state in a few years’ time, and Redmond property values (though I don’t think there’s much private land being acquired there?). IE it’s not very predictable. The property taking for Redmond Link is pretty much entirely state/city land, so I don’t think it will be the same as Lynnwood Link (which required more than a few homes with relocation of residents). Al S. for the last few weeks, media has been telling me that a trade war with some of this country’s oldest allies is either likely or soon underway. And due to tariffs, certain to raise prices on not only steel and aluminum, but many things both connected with them and not. Since vast majority of budgeting long pre-dates these events, if project costs do go up….can you blame our accountants for sudden increase in every area of the budgets? A recent example of a budget calculation that’s started losing Sound Transit money since opening day. From opening day at UW, it’s been plain that passenger loads far exceeded largest estimates. Might always be a good idea to spend on the large side. Money left over can be held in an interest-bearing account for repairs-over project lifetime, a hundred percent necessary. But I think it’s most important to design for max flexibility. For elevators and escalators, for instance, larger shafts and openings surrounded by removable tiled floor space. Or various storage or utility compartments that can be left in place for years, and then quickly adapted when time comes to invest in the larger passenger-moving equipment. Or benches dispensable when passenger load warrants. To me, ability to expand quickly could be more important than estimation of how much and when in the future.